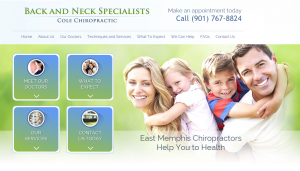 East Memphis Chiropractor Website Design – Just Launched! Serving the East Memphis, Tennessee area since 1973, Dr. Cole has been practicing chiropractic care at the same location for the past four decades. His son joined the Back and Neck Specialists team in 2011, allowing the practice to offer customized treatment plans from two health experts. Dr. Cole and his son Josh believe in educating patients on the specific problems they’re dealing with so they understand the root causes of their discomfort. Perfect Patients is pleased to launch the new Back and Neck Specialists website. Furnished with unique new content, we look forward to seeing Dr. Cole’s practice grow as our online marketing efforts progress into the coming months.